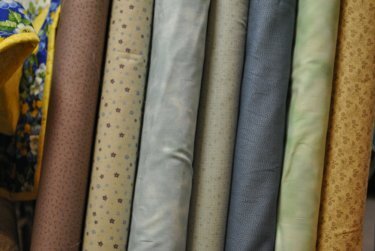 Mom had sent out an email on new fabrics out on the floor on Saturday. I thought you might want to see what Mom & Liz had put out. Liz decided to clean out the fabric store room and that she did. 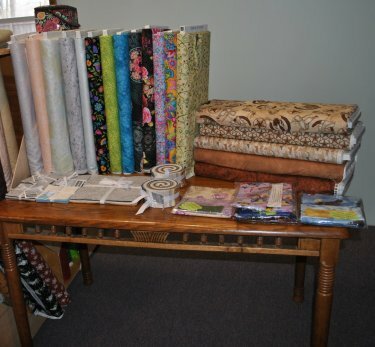 Here are some of the fabrics Liz and Mom pulled out & made displays for. Notice they took my dinner table away from me. Nothing is safe with them around. I better keep an eye on Obi or they may turn him into a display, too. Here is a close up of some RJR, Moda, Red Rooster, Elizabeth's Studio and Fabric Freedom that occupies the rocking chair. Here they are in the rocking chair. Behind the rocker is a nice train panel from RJR and a small collection of Northcott's Crackle can be seen on the green bench by the wall. But, here's what I really want to make you quilters aware of. 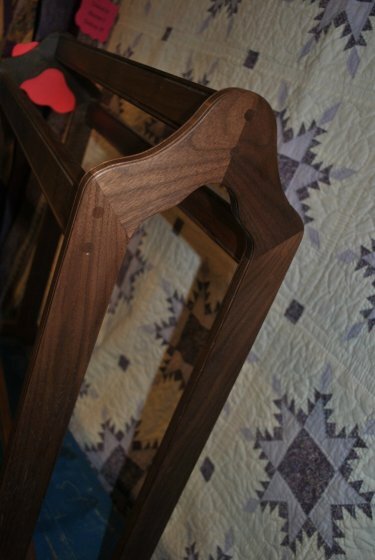 The following photos are of 2 (1 solid cherry & 1 solid walnut) quilt racks. The man who made them is a retired cabinet maker and use a finish used for cabinets that will not get sticky like some finishes in the Summer. They are definitely heirloom quality. Those who know me, know I know quality wood work. I only wish I could be this good. He is from Wyalusing area and just like to make them to keep busy. He is asking $100 for each quilt rack. If you are looking for a quilt rack, these are definitely the ones to buy. Skip the internet, come here and pick up one of these beauties. Not the wood your looking for, ask us and we'll get his information for you. This baby will hold a heavy quilt. I have no doubt. The workmanship is simply and elegant. 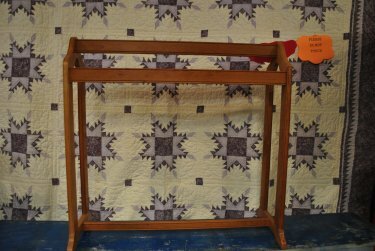 Get rid of that dowel quilt rack and come in and pick up this one, instead. You won't regret it. 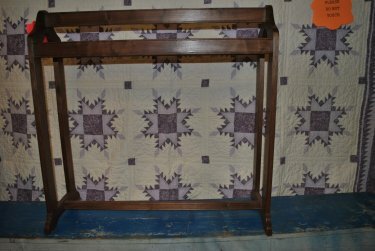 This is the Walnut quilt rack. You see those round things. They're called pins. They are much stronger than screws. 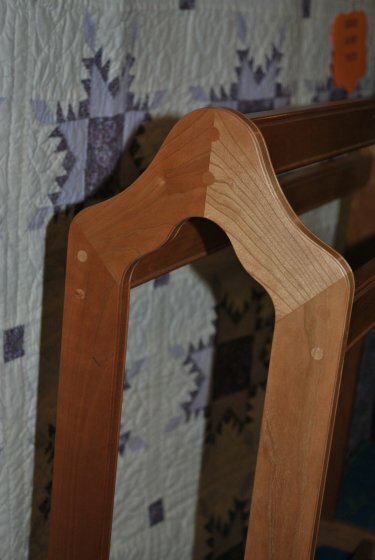 The finish on this quilt rack is as smooth as glass. You can see the elegant router work on the edges. Screws bend, pins don't. This is the Cherry version. Same design and sturdiness just in a lighter colored wood. Here you can see the pins better. And the elegance shows up a little better. "hobby". You have to get rid of the excess finished projects somehow. Mother's Day is coming up next month and one of these would make a great heirloom Mother's Day gift without having to spend a fortune. If that cherry one isn't gone by the time I save up a $100, it's may be going to my house to corral all of the quilts and blankets running loose around my living room. Sorry about going on about the quilt racks. My passion is wood and plastic model cars, Mom & yours is fabric. When I see a wood product that is heirloom quality and this price, I really want people to be aware of it. You really shouldn't miss out on one of these. 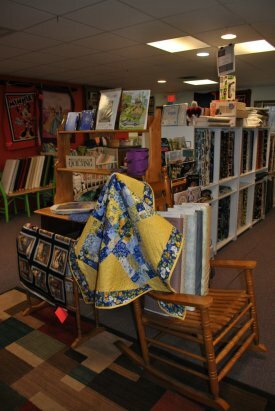 Stop in and see our new fabrics and check out these quilt racks. If you come in and help give all that fabric on my dinner table a new home, I would appreciate it. I miss my dinner table. Sorry Obi didn't get his 2 cents worth. He's "helping" Grandma in the kitchen. Sharon C., did you get this email? Keep that stash full and the seam ripper handy!